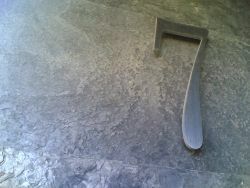 7 (seven) is a number, numeral, and glyph that represents the number. It is the natural number that follows 6 and precedes 8. It is an integer and a cardinal number, that is, a number that is used for counting. In addition, it is classified as a real number, distinguishing it from imaginary numbers. In the beginning, various Hindus wrote 7 more or less in one stroke as a curve that looks like an uppercase J upside down. The main contribution of the western Ghubar Arabs was to make the longer line diagonal rather than straight, though they showed some tendencies to making the character more rectilinear. The eastern Arabs developed the character from a 6-look-alike into an uppercase V-look-alike. Both modern Arab forms influenced the European form, a two-stroke character consisting of a horizontal upper line joined at its right to a line going down to the bottom left corner, a line that is slightly curved in some font variants. As was the case with the European glyph, the Cham and Khmer glyph for 7 also evolved to look like their glyph for 1, though in a different way, so they were also concerned about making their 7 more different. For the Khmer, this often involved adding a horizontal line above the glyph. This is analogous to the horizontal stroke through the middle that is sometimes used in handwriting in the Western world, but it is almost never used in computer fonts. This horizontal stroke is, however, important to distinguish the glyph for seven from the glyph for one in writings that use a long upstroke in the glyph for one. On the seven-segment displays of pocket calculators and digital watches, 7 is the number with the most common glyph variation (0, 6 and 9 also have variant glyphs). Most calculators use three line segments, but in some brands of calculators, 7 is written with four line segments. The reason is that in Japan and Korea, 7 is written as ① in the illustration to the right. While the shape of the 7 character has an ascender in most modern typefaces, in typefaces with text figures the character usually has a descender, for example, in . Some people, especially in Europe and Latin America, write 7 with a line in the middle and make the top line crooked. The line through the middle is useful to clearly differentiate the character from the number one, as these can appear similar when written in certain styles of handwriting. A seven-sided shape is a heptagon. The regular n-gons for n ≤ 6 can be constructed by compass and straightedge alone, but the regular heptagon cannot. Figurate numbers representing heptagons (including seven) are called heptagonal numbers. Seven is also a centered hexagonal number. In quaternary, 7 is the smallest prime with a composite sum of digits. It is obvious that a symmetry exists with no electromagnetic charge. It is assumed here, that the size of charge is linearly dependent on the number of quanta of angular spin generating it. In the state of symmetry no magnetic component is generated because no angular spin exists. A particle in such a supersymmetric state would be dark because it cannot electromagnetically interact. Breaking of supersymmetry of this topologically substructured superstring particle would be a change of its angular spin, generating corresponding particles of physics in dependence of the energy level. This angular spin not only generates charge but highly non-linearly also gravo-magnetic mass in dependence of string tension (energy). There seems to be only one generic unique geometry with a fixed functionality of a weak interacting superstring dark stem particle.(0. generation). In generations one to three there are two sets of three physical particles with opposite charge according to the direction of angular spin. For all three generations only two geometrically and functionally identical dark stem particles exist. These only differ by their handedness, generating matter and antimatter particles on breaking of 0-spin symmetry. The occurrence of matter and antimatter particles is asymmetric with respect to this symmetry, -3 -1 +2 for matter and -2 +1 +3 for antimatter. Both sets of three particles are arranged in a complementary way around the symmetry enabled by this global physical realization of the number seven. Thus the number seven only emerges as a complementary superposition of two sets of physical particles that are generated by breaking of a supersymmetric state. Nature only makes use of the symmetry provided by the number seven. It however does not actually realize it. Seven seems to be more 'constructed' by arranging two sets of entities representing the number three around a state of symmetry. Seven stellar objects in the Solar System are visible to the naked eye: The Sun, the Moon and the five classical naked eye planets, namely, Mars, Mercury, Jupiter, Venus, and Saturn. In Indian astronomy, seven saints appear in a constellation called "Saptharishi Mandalam"
The Saros number of the solar eclipse series that began on April 8, 2590 B.C.E. and ended on May 16, 1310 B.C.E. The duration of Saros series 7 was 1280.14 years, and it contained 72 solar eclipses. 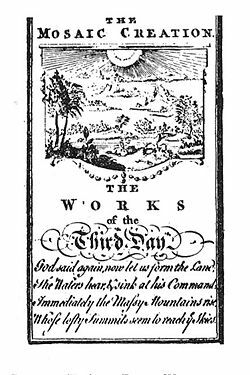 The Saros number of the lunar eclipse series that began on July 16, 2595 B.C.E. and ended on February 22, 1008 B.C.E. The duration of Saros series 7 was 1586.65 years, and it contained 89 lunar eclipses. God rested on and sanctified the seventh day (Sabbath). The Counting of the Omer leading up to the Giving of the Torah is expressed as "7 times 7 weeks"
Shiv`a (another pronunciation of the Hebrew word for 7—(Hebrew: שבעה ; "seven")), is the number of days of mourning. Hence, one sits Shiva. As in Shiva (Judaism). The weekly Torah portion is divided into seven aliyahs, and seven men or boys over the age of 13 are called up for the reading of these aliyahs during Shabbat morning services. Seven blessings are recited under the chuppah during a Jewish wedding ceremony. A Jewish bride and groom are feted with seven days of festive meals after their wedding, known as Sheva Berachot ("Seven Blessings"). The number of Ushpizzin (also known as the "Seven Shepherds") who visit the sukkah during the holiday of Sukkot: Abraham, Isaac, Jacob, Joseph, Moses, Aaron, and David. The number of nations God told the Israelites they would displace when they entered the land of Israel (Deut. 7:1): The Hittite, the Girgashite, the Amorite, the Canaanite, the Perizzite, the Hivite, and the Jebusite. In Breslov tradition, the seven orifices of the face (2 eyes, 2 nostrils, 2 ears, and the mouth) are called "The Seven Candles." The menorah (Hebrew: מנורה), is a seven branched candelabrum lit by olive oil in the Tabernacle and the Temple in Jerusalem. The menorah is one of the oldest symbols of the Jewish people. It is said to symbolize the burning bush as seen by Moses on Mount Sinai (Exodus 25). The total number of Prophets sent by God are 124000. The sum of 1+2+4=7. The number of followers to fight alongside Jesus Christ and Imam Mehdi against the anti-Christ/dajjal is 313. the sum 0f 3+1+3=7. The mystical text "The Seven Valleys," by the Prophet-Founder Bahá'u'lláh, relates the journey of the soul through the seven "valleys" of Search, Love, Knowledge, Unity, Contentment, Wonderment, and finally True Poverty and Absolute Nothingness. The number of sleeping men in the Christian myth of the "Seven Sleepers"
The number of sages in Hindu mythology; their wives are the goddesses referred to as the "Seven Mothers"
In Irish Mythology, the epic hero Cúchulainn is associated with the number 7. He has 7 fingers on each hand, 7 toes on each foot, and 7 pupils in each eye. In the Irish epic Táin Bó Cúailnge, Cúchulainn is 7 years old when he receives his first weapons and defeats the armies of the Ulaidh. and his son Connla is 7 years old when he is slain by Cúchulainn in "The Death of Aife's Only Son." In music, the Roman numeral vii is the leading tone (vii°) or subtonic (VII) scale degree, chord, or diatonic function, when distinguished V = major and v = minor. In The Lost Years of Merlin Trilogy, a book is titled "The Seven Songs of Merlin"
In the Harry Potter series of novels by J. K. Rowling, seven is said to be the most powerfully magical number. There are a number of references to seven in Harry Potter: There are a total of seven books in the series; Ginny Weasley is the seventh child and only daughter; Harry Potter was born in July, the seventh month of the year; Wizarding students must complete seven years of school at Hogwarts; Lord Voldemort splits his soul into seven parts which he believes ensures his immortality. Seven is also the number on the back of Harry Potter's Quidditch robes (Prisoner of Azkaban movie). In Quidditch each team consists of seven players. Chapter four of Book 7 is titled "The Seven Potters." In The Two Towers, the second volume of J. R. R. Tolkien's The Lord of the Rings, the following poem appears: "Tall ships and tall kings/Three times three/What brought they from the foundered land/Over the flowing sea?/Seven stars and seven stones/And one white tree." The "foundered land" is Númenor, and the "Seven Stars" are unknown, but they may refer to a constellation, the Sickle of the Valar. The Seven Stones are the palantíri, the seeing-stones. Also in The Lord of the Rings, the Dwarves were given seven rings. In The Silmarillion, also a Tolkien work, there are seven Lords of the Valar, and seven Ladies of the Valar; Fëanor, a central character, has seven sons: Maedhros, Maglor, Celegorm, Curufin, Caranthir, Amrod, and Amras. In Galician folklore, a seventh son will be a werewolf. In other folklores, after six daughters, the seventh child is to be a son and a werewolf. In other European folklores, the seventh son of a seventh son will be a child with special powers of healing and clairvoyant seeing. In Fist of the North Star (Hokuto no Ken), the main character, Kenshiro, is also known as "the man with seven wounds" for the seven scars on his body in the shape of the Big Dipper. Aleksis Kivi's "Seven Brothers," the most famous book of Finnish literature. Seven Pillars of Wisdom, a book written by T. E. Lawrence. The Secret Seven, name of a children's adventure book by Enid Blyton. The book Seven Years in Tibet. The character 7 (Nana) and the organization Septimal Moon in Loveless (manga). The Seven Habits of Highly Effective People, a book by Stephen Covey. Team 7 consists of the main characters in Naruto: Naruto Uzumaki, Sasuke Uchiha, Kakashi Hatake, and Sakura Haruno. In the One Piece series, the Shichibukai (literally, "Seven Military Seas," known in the English versions as the "Seven Warlords of the Sea") are seven powerful pirates who work for the government. In the Dragon Ball series, there are 7 Dragon Balls that can grant any wish. In the InuYasha series, the Shichinintai are, as their name says, a band of seven mercenaries. In the Nana series, there are many recurrent instances of the number seven ("nana" is the Japanese numeral for the English "seven"), including the name of both main characters. In George R. R. Martin's A Song of Ice and Fire, seven gods, the Mother, the Father, the Warrior, the Crone, the Smith, the Maiden, and the Stranger, are worshiped in the land of Westeros, which is made up of seven former kingdoms and often called the Seven Kingdoms. The Seven are the primary deities of Westeros. In The Dark Tower series by Stephen King, there are 7 books. In The Wheel of Time series by Robert Jordan, there are 7 seals on the Dark One's prison. In Neil Gaiman's Sandman series, there are 7 Endless: Destiny, Death, Dream, Destruction, Despair, Desire, and Delirium. The Saga of Seven Suns, a series of seven novels by Kevin J. Anderson. In George Orwell's Animal Farm, there are seven commandments, and the song " Beast of England" is sung seven times after the animals overthrow Mr. Jones. In Septimus Heap, book one, Magyk. Septimus Is the seventh son of a seventh son, 7 is believed to be the most magykal number. In the first of the three Deltora Quest series of books by Emily Rodda, the protagonist must collect the seven gems of the fabled Belt of Deltora: Topaz, ruby, opal, lapis lazuli, emerald, amethyst, and diamond. Each of the seven gems are guarded by one of seven guardians located in one of the seven locations around Deltora: The Forests of Silence, Lake of Tears, City of the Rats, The Shifting Sands, Dread Mountain, Maze of the Beast, and Valley of the Lost. In Ultimate Frisbee, each team has seven players on the field. In team handball, the number of players on each team including the goalkeeper. In rugby league, the scrum-half/halfback. In rugby union, the openside flanker. In American football, the number of players who, by rule, are lined up at the line of scrimmage. In scoring baseball, seven represents the left fielder's position. In baseball, the 7th Inning stretch is attributed to the 27th U.S. President, William Howard Taft. In high-school baseball a regulation game lasts seven innings. In the NHL, MLB, and NBA, seven is the maximum number of games played in a playoff series. Rugby Sevens, a variant of rugby union and rugby league, contains only seven players per side instead of the standard 15 (union) or 13 (league). The Rugby World Cup Sevens, the World Cup for the union version of Sevens. The IRB Sevens World Series, also in the union version of Sevens. Rainbow colors: Red, orange, yellow, green, blue, indigo, and violet were originally named as the seven colors of the rainbow, though blue and indigo are considered by some to be the same color. Seven is the smallest positive integer whose name in English is more than one syllable long. The Kulin people of Australia living near the Dandenong Ranges traditionally have seven seasons. Some of the Native Americans of Montana also have seven seasons: Chinook season, muddy spring, green summer, gold summer (or dry summer), "Indian" Summer, late fall, and cold winter. The United States Constitution, as drafted in Philadelphia in 1787, was composed of 7 Articles. The United States declared Independence in the 7th month of 1776. 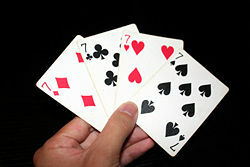 In a standard deck of playing cards the 7 of Diamonds is the only diamond card that can be viewed as upside down when reversed. Seven is the traditional number of Wonders of the Ancient World. Seven is the figurative number of seas. Seven is the number of chakras. Seven is the number of basic principles of the bushido. Seven is the number of points on a sheriff's star. When rolling two standard six-sided dice, seven is the number most likely to occur. It is the sum of any two opposite sides on a standard six-sided die. The Heptarchy, from the (Greek for seven realm, is the name applied by historians to the period (500-850 C.E.) in English history after the Anglo-Saxon conquest of England, derived from the seven kingdoms of Northumbria, Mercia, East Anglia, Essex, Kent, Sussex, and Wessex, which eventually merged to become the Kingdom of England during the early tenth century. September was the seventh month in the ancient Roman calendar, as its name indicates. After the reform that led to the current order, the seventh month is July. Septidi was the seventh day of the decade in the French Revolutionary Calendar. Cibola was one of the legendary Seven Cities of Gold the Spanish thought existed. In casinos, the line 7-7-7 (triple seven, not seven hundred seventy-seven) is a common winning line on slot machines. Seven babies delivered in a single birth are called septuplets. In the Catalan culture, seven is used in many popular stories. A survey of 2000 people in England showed seven to be the most common lucky number. ↑ Georges Ifrah, The Universal History of Numbers: From Prehistory to the Invention of the Computer, Translated by David Bellos et al. (London: The Harvill Press, 1998). ↑ Saros Series 7 Saros Series Catalog of Solar Eclipses, NASA Eclipse Web Site. Retrieved October 16, 2017. ↑ Saros Series 7 Lunar Eclipses of Saros Series 1 to 175, NASA Eclipse Web Site. Retrieved OCtober 16, 2017. ↑ Bible Gateway, Matthew 18:21. Retrieved October 16, 2017. ↑ Bible.org, Seven Suicides in the Bible. Retrieved October 16, 2017. Wells, D. G. The Penguin Dictionary of Curious and Interesting Numbers. London, UK: Penguin Books, 1998. ISBN 0140261494. This page was last modified on 26 October 2017, at 23:48.